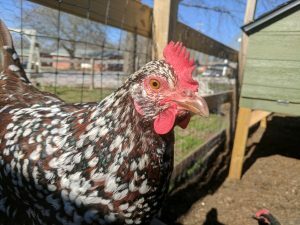 Can chickens change the world? It’s easy to look at our world today and buy into a narrative of hopelessness and despair. The headlines in our 24/7 news cycle world are never lacking for violence, fear, and desperation. Even while our world grows smaller and cultures grow closer through the almost-miraculous information-sharing capability of the internet, we often feel deep insecurity in the midst of perpetual national and international intrigue, cultural infighting, and division. Is there any hope? 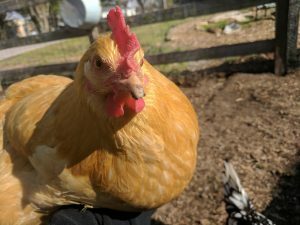 And here’s a crazy question: Can chickens help us? Well, my idealistic answer is YES! I’ve kept chickens for over eight years, and they have taught me and my family many lessons about how chickens change the world, literally! While we separate ourselves into geopolitical entities fighting over land, resources, and ideologies, the egg on our plate at breakfast—the one from a chicken we KNOW that lives in our own backyard—teaches us WE ARE ALL CONNECTED. We’re connected to each other, to our planet, to the universe itself. How do my chickens’ eggs teach this lesson to my family? Maybe you’ve not thought about it, but that egg that was provided by your hen was produced inside her body using the nutrients you provided for her through your tender care, including a good, quality, complete layer feed, leftovers from your garden and kitchen, and the bugs and forage she found by scratching around in your yard. All that forage and feed was ultimately provided by the sun, the rain, and the earth. Without those ingredients, there would be no chicken feed, bugs, worms, chickens, humans, or you. And all of that is a product of the universe. It’s easy to miss this lesson when we get our eggs from the grocery store and never see the anonymous hen that laid it. When we don’t see her living conditions, don’t take part in caring for her, and haven’t invested in her in any way, it’s easy to overlook the fact that she used the food provided to her to make an egg that provides food for you. But you don’t overlook this when the hen is in the backyard. With a pet hen, you see her everyday, you raised her from a chick, and she has a name (Henrietta?). You’ve provided food for her, a safe place to forage, and—imagine this—maybe you actually even love this pet hen like a family member. It’s easier to see the lesson in these circumstances. And it’s easier to teach your children lessons about compassion and interconnectedness, too. Without Henrietta, we don’t have breakfast, while without us, Henrietta doesn’t have a home. The nutrients that previously belonged to the planet literally became a part of Henrietta’s body’s chemistry and produced an egg that we consumed. That egg literally became part of our bodies’ chemistry, so we are literally connected to Henrietta on a chemical/biological level. It’s not too hard to extrapolate from there. If you need Henrietta and she needs you, and both of you need fresh water and clean air to breathe, and both of you need a planet with a biodiverse selection of plants and animals to thrive, and the planet needs the sun to produce that, and the sun exists in a universe which produces billions of stars and planets…We are connected to everything. And if I’m connected to the universe, then it’s not to hard to see that I am connected to YOU, and you to ME. Regardless of our nationality, ethnicity, culture, history, education level, socioeconomic status, or gender—all the concepts we humans create to divide ourselves—we’re all creatures intimately connected to one another, in need of one another. Yes, an egg from a pet chicken can teach us that. What’s the second way chickens change the world? If I see Henrietta ill or suffering, I want to help because I recognize my dependence on her and her dependence on me. I feel sympathy, because there IS a sympathy and commonality between us. I may be embarrassed by how much I love this little bird, and other people may think I’m crazy, but I recognize that she has provided literally HUNDREDS of meals for me. That compels me to have fellow-feeling and compassion for her. When I’m concerned that there might be something wrong, I go to the My Pet Chicken website, looking for articles that may help me determine what’s going on. I can use it to try to find out what’s causing her trouble. If I determine she’s sick, I’ll take her to the vet to try to get help. Once I recognize our connection, compassion follows. Of course, we can apply this principle in a broader way as well. If I can have compassion for a “lowly” chicken, a different species than myself!, then the well of resources I have to feel compassion for others is deep, and I can draw from it to feel empathy for you, too. And you, moved by the connection we all have to one another, can have compassion for my suffering as well. Recognizing that we live in a circle of life that includes predators, prey, and parasites as essential actors in this biologically wonderful drama, we can have compassion for all living things, the wind, the water, and even the planet itself. In so doing, the overwhelming consciousness of “myself” and “other” blurs and we become one, working together for peace, healing, and yes, even LOVE. And idealistic view of the world? Of course. And hopeful? Absolutely. And I prefer hope rather than despair. I bet you do, too. What valuable life lessons have you learned from YOUR chickens? Beautifully written! I’ll have to share this!